The RPS-NODE-9255-Wifi is a single port power distribution unit (PDU) which allows access to its web interface over your local wired LAN or WiFi Network. It is easily configured to allow remote access via the internet through your router to the built in webserver. WiFi encryption is available in WEP / WPA / WPA2 along with a WPS Function for easy setup to your network. This remote power switch allows for login for power control using your Smartphone web browser. The RPS-NODE-9255-Wifi allows you to monitor the voltage and the temperature. Additional features include Power On/Off time scheduling, Auto-Ping Reboot and power on/off control by email. With its optional Handheld IR Remote Control you can control the single power outlet on the RPS-NODE-9255-WiFi directly without logging into the unit. The RPS-NODE-9255-WiFi Remote Power Switch Unit with WiFi Antenna. A Standard PC Cable is used to power the RPS-NODE-9255-Wifi Unit. It connects to the back of the unit. 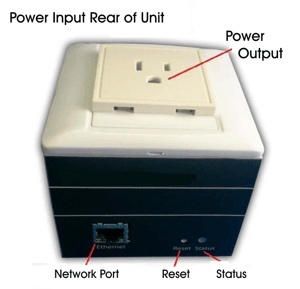 The Output Power Socket is located on the top of the unit. Maximum Output is 12 Amps. The RPS-NODE-9255-WiFi does not have an external ON/OFF switch. When power is supplied to the device, it is ready for operation. It takes approx. 1 minute for boot up before the device is ready for access. Your ROUTER will need to port forward both TCP/UDP packets to the IP address of the RPS-NODE-9255WiFi Unit on your internal network. This will enable you to control your Remote Power Switch from anywhere on the internet using your web browser. The Product Code for the US Version of the unit is RPS-NODE-9255-WiFi-US. The RPS-NODE-9255-Wifi is available in several foreign electical sockets as noted above. Lead time for conversion and shipment with the above configurations typically is 7-10 business days.